Summertime is water time — and we’ve got five fantastic ways you can hit the wet stuff this summer in Taos. From rafting to hot springs, paddle boarding the more, there’s a water adventure for everyone in Taos. How will you test the waters? 1. Hop Into the Hot Springs: New Mexico is home to some of the most indulgent and beautiful hot springs in the world. Just south of Taos, you’ll find Ojo Caliente Mineral Springs. Deemed sacred by Native Americans, these legendary waters have been soothing body, mind and spirit for centuries. If you like your water a balmy 97 degrees, Taos has several hot spots for you right beside the Rio Grande. 2. Get Ready to Raft: Looking for a wild ride? Ride the Taos Box rapids, with names like Dead Car and Pinball. Calm and steady more your speed? Coast the mellow stretches of the Rio Chama. Several river outfitters call Taos home, including New Wave Rafting (great for kids!) and Big River Rafting Trips, so there’s no shortage of tours and rentals. It’s a fun family adventure you’ll never forget. 3. 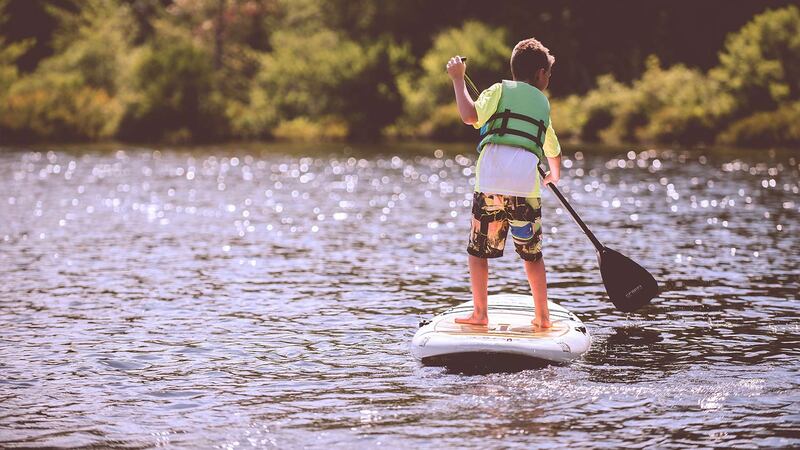 Paddle On: Standup paddle boarding, or SUPPING, originated in the Hawaiian Islands and is now one of the most popular water activities in North America and beyond. From coasting down a calm river to performing yoga poses on a paddle board, there’s something for every skill level and interest. Ready to get your paddle on? Try New Mexico River Adventures, Cotta’s Rio Grande Rafting or Far Flung Adventures, for top-notch rentals and tours. 4. Go Fish: What’s your pleasure? From serene solitude to bushwhacking, Taos waters have something for every fisherman (and woman). Northern New Mexico offers mid-summer anglers a welcome relief from the summer heat. There’s also a range of choices for bountiful lake and public and private river fishing. The Taos waters are well-known for excellent trout fishing — along with Rainbow, Brown and Brook Trout, the Taos area is home to the native Rio Grande Cutthroat trout. And with a variety of services aimed at helping you create your perfect day of fishing — Red River Fishing, Rio Grande Float Fishing and more — you’re guaranteed to reel in a day of summer fun. 5. Kayak for Kicks: Kayak-lovers have plenty of lake options to choose from in Taos, including Racecourse and Lower Taos Box on the Rio Grande. The abundance of tall mountains and north-central New Mexico’s location just south of the Colorado Rockies create cascades of whitewater every spring. From small tributaries to the ‘Mother’ Rio Grande, the north-central waterways are a river runner’s paradise. Need a rental? We suggest: Cotta’s Rio Grande, Los Rios River Runners, New Mexico River Adventures and New Wave Rafting. Back ToAll Posts Up Next Here’s to you, Hopper!